You don’t get to ride in a Riva every day. It’s not that they’re scarce, exactly. 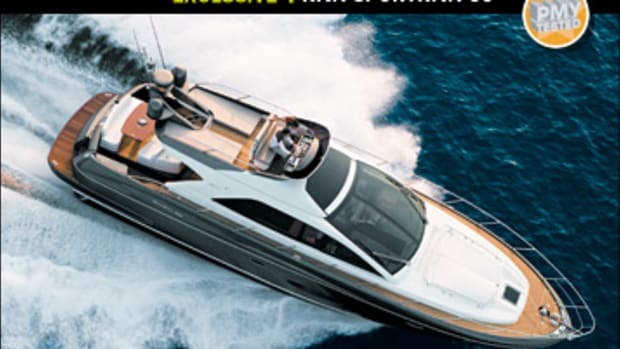 In the six years since the first of the “new” Rivas, the Aquariva runabout, came out, the company has launched no fewer than eight other new models. But demand appears to be outstripping supply to such a degree that few boats hang around long enough for mere journalists to get a hold of them. So to turn up at La Spezia, Italy, on a crisp February morning and see a brand-new 63 Vertigo waiting at the quay is kind of a special moment. 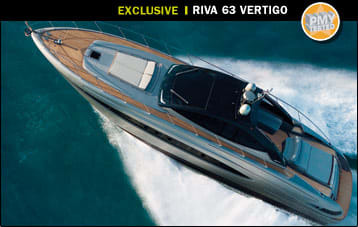 In Europe the Riva name carries cache like no other. There isn’t a boatbuilder anywhere that can claim such positive brand associations as this one, which became so indelibly associated with the high life during the heady 1950’s and 1960’s. And they know it. 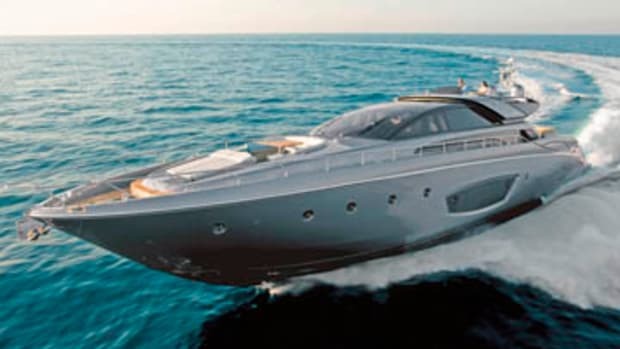 The current custodian, the giant Italian Ferretti Group, is happy to trade on the boatyard’s sun-kissed mahogany past. And why not? If you had pictures of a 25-year-old Brigitte Bardot decorating one of your boats, you’d be damn silly not to use them. Ferretti hasn’t taken a wrong step. Since acquiring Riva in 2000, it has firmly re-established the company with a range of retro-style craft, starting with that sublime Aquariva, a model designed to evoke the elegance of the famous wooden Aquarama and conceived during the brief regime of Anglo-Italian entrepreneur Stephen Julius, now of Chris-Craft. 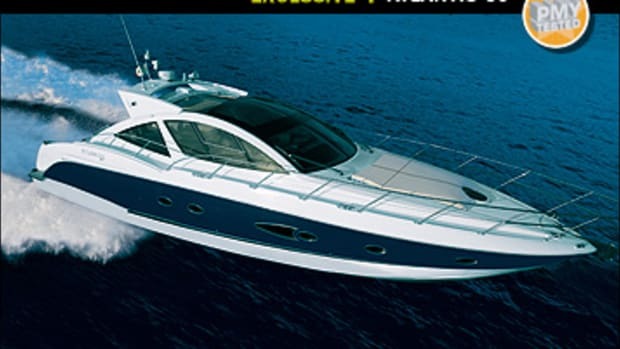 The new boats look right, they go, they’re reassuringly expensive, and they sell. 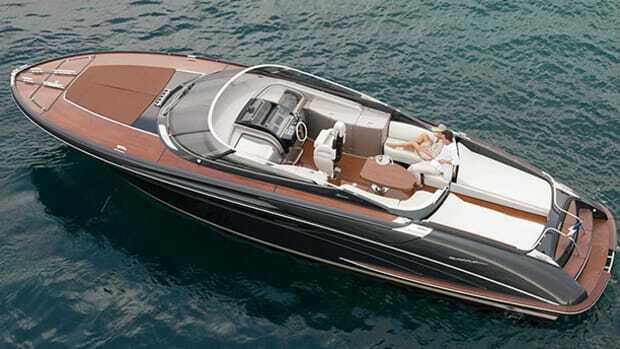 Riva’s past has been reinvented in fiberglass. If there is a downside to owning such an evocative brand, it’s in managing customer expectations. The old mahogany runabouts, so beloved of the Riviera jet set, really did come about as close to perfection as production boats can. They epitomized not just style and glamor, but also handmade quality. They had a magic that only comes from thousands of hours of painstaking craftsmanship. Yet today’s Riva is built in the modern way. It has to be. It’s no good looking for handmade dovetail joints, brass piano hinges, and nine coats of varnish applied by hand because no one can afford to build production boats like that anymore. Still, to judge from some of the work going on in the sheds at La Spezia—the careful filling, fairing, and painting of every new hull, fresh out of the mold—Riva maintains an obsessive attitude toward quality that few other boatyards share. And there was certainly something magic about the styling of my 63 moored at the quay. There’s nothing retro about it. 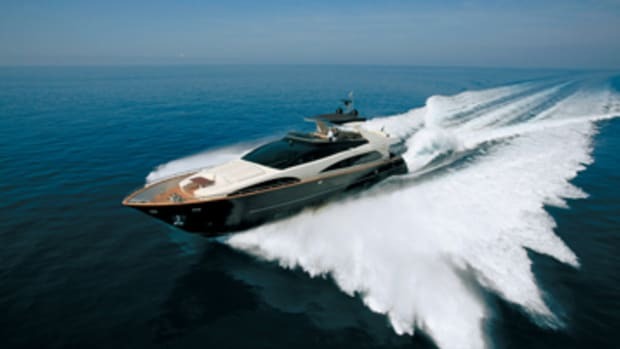 The Vertigo follows on from 2005’s menacing, dark-hued 68 Ego and is as modern and aggressive as any sport cruiser on the market. It’s a look that promises performance, and the 63 packs a hefty punch: 24 cylinders of Nurnberg’s finest heavy metal, offering more than 2,700 hp. 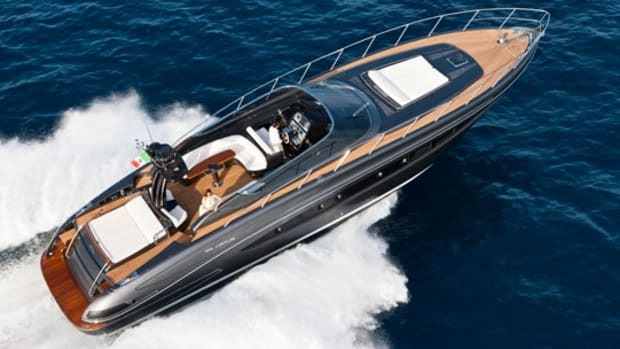 But don’t look for jets or surface drives—there are certain traditions that Riva still stands for, and shaft drives, for the moment at least, are sacrosanct. Out on the water the Vertigo delivers on her promise: More than 40 knots (46 mph) in a straight line is right at the edge of the envelope for this drive configuration, and the way she gets there is nothing short of spectacular. I normally time acceleration in 5-knot increments, but once the turbos kicked in and the props bit, the Vertigo was too fast for that. Five seconds between 20 knots and 30 is as quick as I’ve seen outside a raceboat. Of course you need fairly modest bottom sections for this, and the Vertigo’s 12-degree transom deadrise deepens only mildly towards the forefoot, which felt pretty unforgiving on the few waves we managed to find. You probably won’t be trying for 40 knots upwind in any kind of sea. The helm was light and responsive, and the Vertigo banked willingly, but at around 250 yards her turning circle was surprisingly wide. And what of her sybaritic side? The old Rivas went well, but they also offered luxury. The new Vertigo is clearly a hot performer, and down below features a pleasing combination of near-black wenge hardwood and contrasting pale oak, with dark, leather-clad bulkheads, white upholstery, and a spectacular eight-seat, glass-top dining table. It’s rich without being gloomy, thanks to substantial windows in the topsides to bring daylight into the saloon and galley as well as a series of ports and, of course, a glazed foredeck hatch. 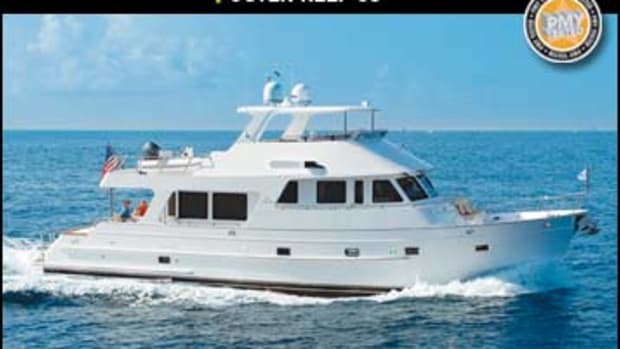 She’s a three-cabin boat, with the owner’s suite amidships, a VIP double in the bow, a small twin-bunk cabin aft of the galley, and a day head and shower across to starboard. The layout works quite well. Thanks to the small third cabin, the saloon feels especially spacious, with seven-foot headroom, while to port the long galley is unusually well provided with stowage and worktop space. Down in the owner’s suite, the 76"x63" double berth lies athwartships between two mirrored bulkheads fore and aft—the mirrors make the most of the light streaming in through the ports and offer the illusion of infinity. 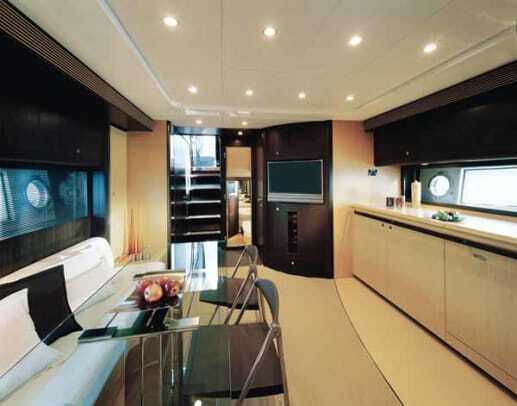 There are a small fold-down dressing table, two hanging lockers, and a head that occupies the whole starboard side, with plenty of open floor space and a large separate shower. Up in the bow, meanwhile, the double berth is set well forward and high up the hull sides, and although headroom is reduced to 6&apos;4" at this point, there’s standing room across the full five-foot width of the berth as well as a useful volume of practical stowage in the large hanging locker and the big drawer at the foot of the bed. 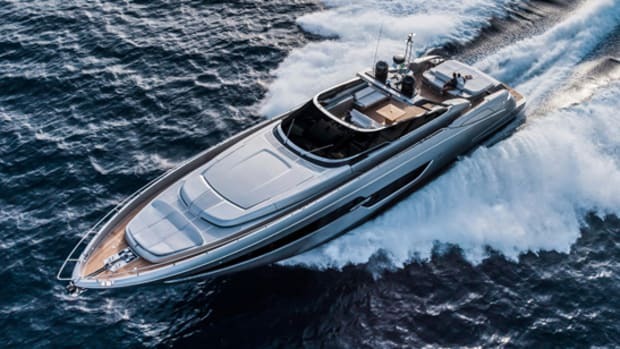 While the overall quality of the finish was good, Riva did not help its case by presenting a new boat to the press before it had time to do a predelivery inspection. Even knowing that the minor imperfections would be fixed, I was left brooding on the challenge that the yard faces: If you’re building a boat using the same techniques and hardware as everybody else, it takes extra effort to make it special. One area where the Vertigo definitely lives up to the Riva name is in the quality of her design—and on deck she displays her true party piece. Not the entertaining driver’s seat or the electric cockpit awning or the hatch over the helm, although they’re all pretty cool. It’s the cockpit seating. With the table aft you’d expect to fill in with stools or extra chairs, blocking access fore and aft. But the starboard sofa slides across on tracks, which creates an unusually comfortable dinette and an unobstructed walkway to starboard. It’s so simple and so effective that you wonder why you haven’t seen it before. Engine access is straight down through a hatch in the cockpit sole, which opens to reveal a tightly packed machinery space. The MAN V-12s are matched with down-angle, V-drive gearboxes that sit level and have reasonable access all around. But with the tender well obtruding from the stern, the genset to the starboard quarter, and the crew cabin bulkheads to port, there’s not much service space. You may need to hire small mechanics. Testing a Riva presents more philosophical problems than practical ones. Here is a modern sport yacht that looks great outside, works well inside, and goes like a bat out of hell—but is the old magic still there? The market is more competitive than ever, and standards have never been higher. 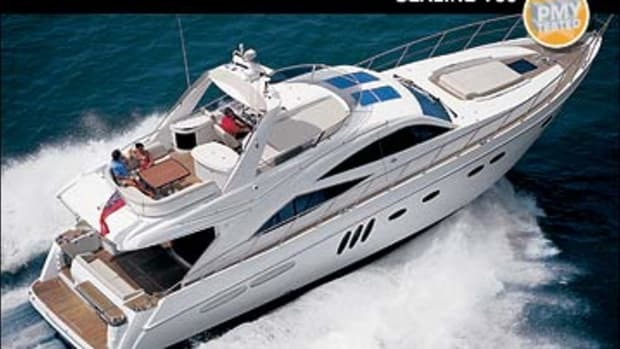 Even within the Ferretti Group, there are boats to rival the Vertigo that offer higher performance and sharper handling plus build quality and detailing at least as good. That just leaves the Vertigo’s clever cockpit and the layout, which are great, and her styling, which is terrific. She’s a tour de force: sleek, aggressive, confident, and new. Is she magical enough? Well, she’ll do for me. For more information on Riva, including contact information, click here. Apart from the terrific sliding cockpit sofa, there are plenty of other great design features on the Vertigo. 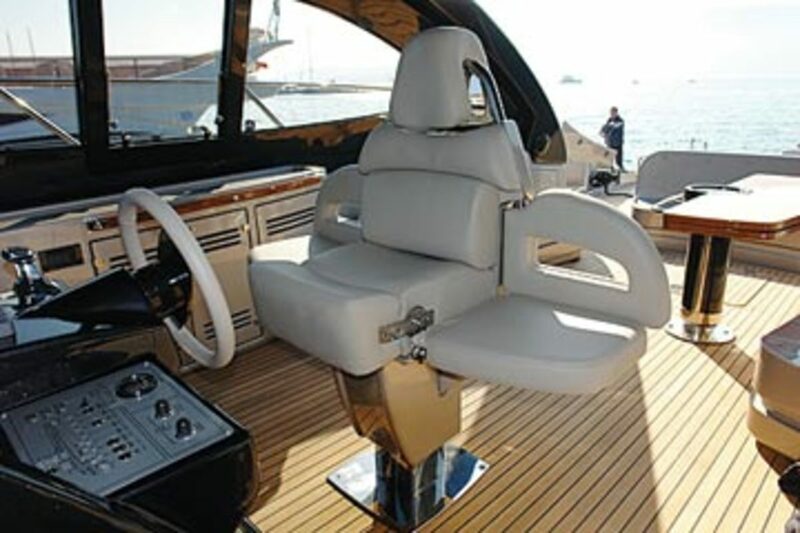 Take the centrally mounted helm seat, pictured here: At first it looks like there is just room for one, but then the side flaps come up electrically, the seat backs swing out, et voila, it seats two more people. The cockpit awning is another neat piece of engineering. Made from lightweight, mildew-proofed fabric, it emerges effortlessly on a sturdy steel frame from the superstructure to dramatically increase the amount of shade in the cockpit. 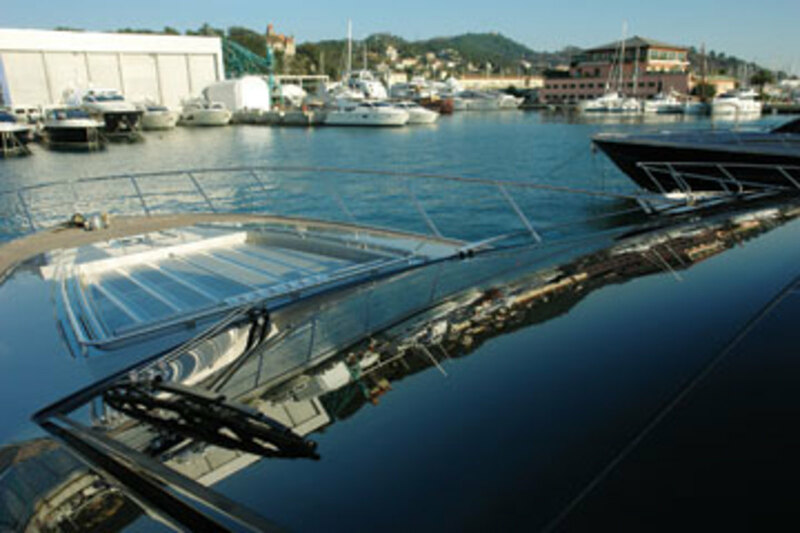 Two heavy-duty, adjustable struts clip into place for added security, and Riva says the structure can safely be left extended at sea. Finally, while ventilation is unlikely to be an issue for most, a small electrically controlled hatch above the helm station is a thoughtful feature that is bound to come in handy on sunny days.—A.H.